Hilke Sievers writes a (trilingual!) 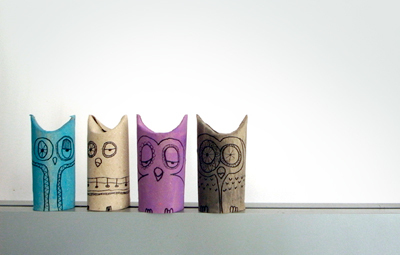 blog called El hada de papel, a log of crafts and activities for children. If I had any kids, I'd plan to trounce them in a round of clothespin catapulting, then craft some quirky toilet paper critters. If you and the youngsters are bored, take a look around the site. Thanks for sharing this - loads of good ideas there! Will try some out this summer! Thanks for the post. It is a challenge to keep them busy on the off days, or when it's just too darn hot for the little ones to do outside. These are great ideas. What a load of easy ideas! usually I refuse to even read any craft post that involves toilet paper tubes... but in this case I will happily make an exception! Given our "summer" so far, and I use the term loosely, I will need plenty of cool/rainy day crafts to keep the children occupied. Thanks!!! I get the best ideas for my preschoolers art projects! Thanks! Yay for crafts to do with kids! I love simple crafts like this to do with my daughter. Even for my kids who are young and don't have much of an attention span I can see some fantastic Ideas. Summer might turn out to be less tedious than I thought. What cute and easy owls! Aherm, do you reckon it's sad to make them if you don't have any kids....? love it! thanks for the share! Thank you sooooo much! I really appreciate so many nice words! Thank YOU for posting such fun ideas, Hilke! Whoa! Love the toilet paper characters!! What a fun site!! I found a ton of things I can't wait to try with my girls!! Too bad this seems to be a ripoff (and there are many) of http://matsutakeblog.blogspot.com/2009/09/halloween-craft-1.html - back from '09. These were featured on some big blogs back in late 2009. Even worse that it is referred as an original work. LOVE IT ! Great Idea!! !